The Atlanta Dream came out strong this weekend and have remained undefeated at home while wearing the top record in the Eastern Conference. The Dream began this surge with a slight disadvantage. Sancho Lyttle, forward for the Dream, was sidelined until July 9th, when the Dream play Minnesota. Lyttle was averaging 15.4 points per game, 9.0 rebounds and 2.8 steals per game. With the loss of a key player, Head Coach Fred Williams plans to divide Lyttle’s playing time amongst Angel McCoughtry and Anne Marie Armstrong to help balance out the floor. The Dream faced off with the Seattle Storm on Friday June 14. They fell in an early deficit by scoring 16 points to Seattle’s 19 in the first quarter. Offensively, the pace picked up and the ball movement noticeably improved. Angel McCoughtry was 7 for 13 from the field, and led the team with three assists 14 points in the first half. The Dream ran away with the biggest lead of the night in the second half when they pushed their lead to 18. They ended the night with a 68-59 win over the Storm. The Dream came out strong and confident, but with the return of Lyttle they are even stronger contenders for winning the Eastern Conference Championship this year. 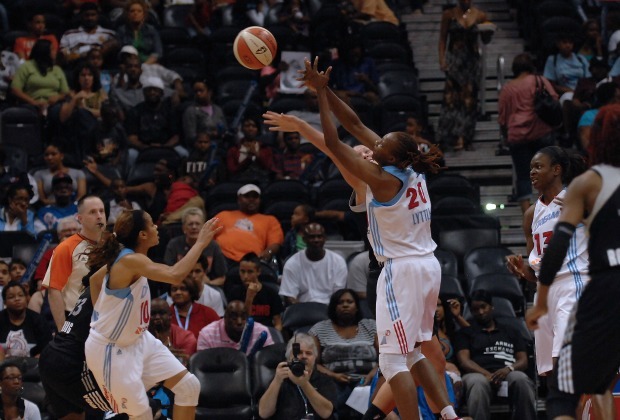 The Dream kept the intensity from the Seattle game defeating the Chicago Sky 88-74. Angel McCoughtry scored 23 points and Erika de Souza had 16 points and 11 rebounds. With an overall record of 7-1, the Dream head back onto the road June 23 playing at Connecticut.